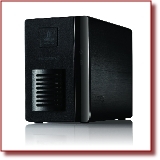 Iomega today announced the availability of Iomega® StorCenter™ ix2 Network Storage in the UK. The ix2 is an advanced two-bay desktop network storage device available in multiple configurations and designed specifically for content sharing and data protection as well as cloud computing and video surveillance applications at small businesses, work groups, remote offices and distributed enterprises. The new two-bay Iomega StorCenter ix2 Network Storage offers small businesses and others the flexible advantages of three different models: a diskless unit that allows users and channel partners the option to populate the device according to their specific storage needs and pricing preferences; a partially populated unit with one drive (1TB, 2TB or 3TB of total storage capacity) that gives users the freedom of choice to increase their storage capacity over time; and a fully populated unit with two drives (2TB, 4TB or 6TB of total storage capacity) for immediate RAID mirroring data protection and other multi-drive network storage capabilities. The diskless version will be immediately available at £119.00 inclusive of vat for the diskless model without any included hard drives, while the partially populated and fully populated are expected to be available starting from June, 3rd. Based on enterprise-class EMC® storage technology, the new Iomega StorCenter ix2 provides up to 6TB* of network storage for small and medium-sized business networks and distributed or remote locations utilizing PC, Mac and Linux computers. The new StorCenter ix2 encompasses many advanced business capabilities usually not available to smaller organizations, including out-of-the-box video surveillance capabilities for up to five IP camera installations. Users can also utilize their choice of cloud backup capability with Mozy, Amazon S3 and EMC Atmos-enabled cloud backup services offered by service providers, as well as Iomega’s revolutionary Personal Cloud technology featuring unparalleled simplicity and versatility for data sharing and protection without any monthly fees or service costs. Designed for central storage and backup of business files with an array of advanced features, the compact two-drive StorCenter ix2 uses a CD-less setup process with downloaded software that has the unit up and running in a matter of minutes. The Iomega StorCenter ix2 series includes a standard three-year limited warranty with phone support up to 13 hours a day, five days a week. Optional service plans include Iomega’s Enhanced Service Plan which includes 24x7 phone support with advance replacement. For more information on Iomega's complete line of StorCenter network storage models,, please go to www.iomega.com.